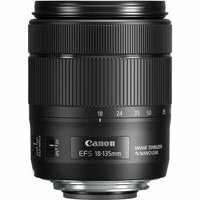 From landscapes to portraits to movies, this versatile Canon EF-S 18-135mm f3.5-5.6 IS USM lens is an all-round zoom well-suited for travel. Nano USM technology allows the lens to focus smoothly and quietly, making it well-suited for movies as well as stills. Canon's 4-stop Optical Image Stabiliser technology counteracts camera-shake for steady handheld results in low light, and features a panning mode for tracking moving subjects. For movies, there's also Dynamic Image Stabiliser, which counteracts extreme movements as well as camera-shake, allowing for smoother footage when shooting handheld.